The war in Yemen reached the 1,000-day mark this week, with much of the country's population on the brink of starvation and reeling from airstrikes on schools, hospitals, markets and mosques. More than 8,700 people have been killed in the often-overlooked conflict, according to the World Health Organization, and millions more are on the brink of famine. 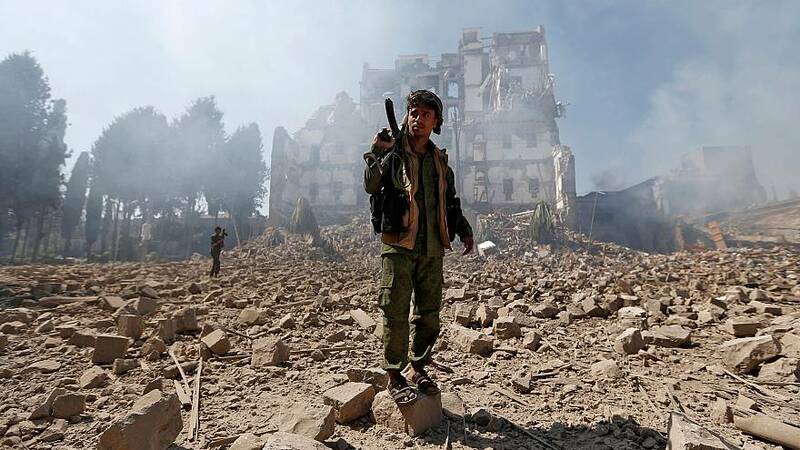 The near-three-year conflict is between the internationally-recognized government of President Abdrabbuh Mansour Hadi and a rebel group known as the Houthis. But it is the involvement of Hadi's backers — a Saudi-led coalition of Arab states supported by the U.S, Britain and others — that has drawn the most vehement international criticism. Many experts see Yemen as a proxy war between Sunni-majority Saudi Arabia and its Shiite regional rival Iran, which is accused of backing the Houthi rebels. Rights groups allege war crimes have been committed by all sides, which could embroil the Western powers. The U.S. and Britain have been intimately involved in prosecuting the war, supplying weapons, logistical help and diplomatic support to their longtime regional ally Saudi Arabia and its coalition, which also includes the United Arab Emirates, Bahrain, Kuwait, Jordan and Sudan. Besides selling weapons to the Saudis, American and British military advisers have provided training and intelligence and the U.S. has helped refuel coalition jets. Saudi airstrikes have repeatedly hit civilian targets — indiscriminate attacks that rights groups say are war crimes — despite sophisticated weaponry and Western intelligence. Saudi Arabia denies the charges, with its U.N. ambassador claiming in October that his country exercises "the maximum degree of care and precaution to avoid civilian harm." Nevertheless, some activists are pushing for Washington and London to face action for allegedly aiding and abetting the Saudis during the campaign. Many experts say this is unlikely for practical reasons, although that hasn't stopped dire warnings from a range of voices including several U.S. lawmakers. In October last year, Democratic Rep. Ted Lieu described Yemen's "civilian carnage" in a letter to then Secretary of State John Kerry and warned that legal precedent "puts U.S. officials at risk of being implicated for aiding and abetting war crimes in Yemen." Earlier that month, Reuters reported that officials at the State Department and other government agencies had privately expressed concern about U.S. complicity in the conflict. More recently, Democratic Rep. Ro Khanna said last month that the U.S. was "aiding Saudi Arabia in Saudi Arabia's committing war crimes." In Britain, the opposition Labour party has called on the government to suspend arms sales to Saudi Arabia, as has parliament's International Development Committee and the Committees on Arms Export Controls. Will Picard, executive director of the Washington-based Yemen Peace Project, is among those researching avenues to legal action. "Often when you want to accuse someone of aiding and abetting a crime, one has to prove that that person intended to abet the crime and wanted the crime to be committed," he told NBC News. "However, international law has held that in the case of war crimes and things that are this serious, the intent qualification is much lower, the bar is much lower, and the fact that the U.S. knows what Saudi Arabia and the coalition is doing with these weapons and this fuel essentially implies intent to aid and abet." The legal precedent cited by Rep. Lieu and others relates to a U.N.-backed ruling in 2013. A special court trying former Liberian President Charles Taylor for war crimes found that "practical assistance, encouragement, or moral support" was enough to establish liability. Writing in September last year, a senior U.N. official said Western governments were not neutral actors in Yemen and were therefore bound by international human rights laws. "Examples of violations of a state's neutrality include supplying war materials, engaging its own military forces, supplying military advisors to a party to the armed conflict, or providing or transmitting military intelligence on behalf of a belligerent," wrote Nathalie Weizmann, legal officer the U.N. Office for the Coordination of Humanitarian Affairs. It is not just the bombing campaign that has drawn criticism of the Saudis and their backers. The coalition's blockade of Yemen's ports in November risked a famine that, according to the U.N., might constitute a war crime or crime against humanity. Saudi Arabia has agreed to partially lift the blockade, although aid agencies say the move is not enough to prevent starvation. The charity Save the Children estimates hunger and disease could kill at least 50,000 Yemeni children this year. Despite the allegations, American and British officials have distanced themselves from civilian casualties, stressing that they had no involvement in the choice of airstrike targets and are not engaged in direct combat. A Pentagon spokesman told NBC News that its support "consists of aerial refueling to Coalition aircraft and intelligence support to assist our partners in securing their borders from cross-border attacks from the Houthis." It added that "the U.S. does not play any role in coalition targeting." Deputy Assistant Secretary for Arabian Gulf Affairs Tim Lenderking also said Thursday that the situation on the ground was chaotic and that not all explosions in the country could be attributed to the coalition. But he criticized the blockade, saying the Trump administration had encouraged Saudi Arabia "to separate the humanitarian piece from the military piece." In any case, it would be difficult to prosecute the U.S. or the U.K., some experts say. "From a legal point of view, it is such indirect support that I can't really imagine how you could make a solid legal case, simply because I think not even Saudi Arabia will be taken to court for what they're doing, and they're the ones directly perpetrating these war crimes," said Andreas Krieg, an assistant professor at the Defence Studies department of London's King's College and a former adviser to Qatar's armed forces. Qatar is currently the subject of an economic and diplomatic boycott by Saudi Arabia and three other Gulf Arab states who accuse it of supporting terrorism, which it denies. In September, the U.N. agreed to appoint experts to investigate alleged human rights violations in Yemen, overcoming strong opposition from Saudi Arabia. However, successful legal action in an international court is unlikely. Neither the U.S. or Yemen are signatories to the International Criminal Court, and although Britain is, it is likely to bring massive pressure to bear against any ICC investigation. Legal action through the U.N. also appears unlikely given the heft of the U.S. and U.K. in the international body, and a trial would likely require the backing of key members such as Russia and China, who have repeatedly blocked measures to address human rights abuses in the past. Yemen is in no state to sue for legal redress and any future stable Yemeni government is likely to be strongly influenced by Saudi Arabia, which is a wealthy neighbor. The U.S. also remains Yemen's largest humanitarian donor, providing more than $1.3 billion in humanitarian assistance since 2015. Still, this does not preclude civil lawsuits being filed by Yemeni individuals or groups for reparations, or a state using universal jurisdiction to try individuals for war crimes. The concept allows a country to prosecute foreign nationals for serious crimes committed abroad, and was used by Spanish judges to arrest former Chilean dictator Augusto Pinochet in 1998 for crimes allegedly committed during his rule in the 1970s and 80s. Activists like Picard are hoping that the threat alone might steer a change of policy. "I think that a lot of officials in the U.S. and the U.K. are very sensitive to the possibility of this type of thing and its impact on their personal reputation and their professional future, not just the fear of actually being criminally prosecuted for something, which is unlikely," Picard said. "It's no fun to go around being called a war criminal, to have that well-justified reputation hanging round your neck," he said.